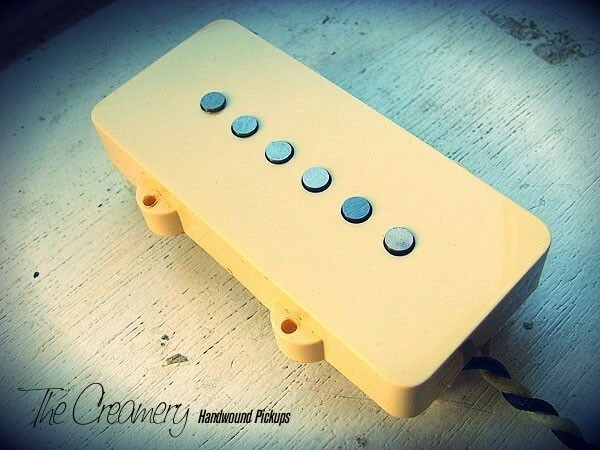 The Alt '88 pickup was inspired by the alternative music scene of the mid-to-late '80s and after feedback from Jazzmaster players the design has now been split into two distinct versions. Whereas the the "Alt '88 - Mid-Range" uses the same taller, stronger rod magnets but is wound with thinner 43awg coil wire for a fatter, fuller, more mid-range voice, the "Alt '88 - Treble" uses thicker 42awg coil wire and taller, stronger rod magnets for a brighter, more cutting, attacking sound. Both have been designed to have similar, higher, more powerful outputs - the difference comes from how they're voiced. With more in the higher frequencies the "Alt '88 - Treble" can dominate in the mix a little more, that bit more aggressive, attacking, cutting - the brash side to its darker, warmer alternative. The Alt '88 range has been a real labour of love and these pickups and have gone through numerous changes before launch just to get them right. A great Jazzmaster rhythm or lead pickup if you want more bite with more of an an alternative/leftfield sound. The Alt '88 Jazzmaster Neck can also be RW/RP if required.